Trying to lose weight can be such an uphill climb. Whether your goal is 5 or 50 pounds, losing weight and keeping it off is never an easy task. There are so many fad diets and newfangled theories about weight loss out there that it’s difficult to tell what works and what doesn’t. Thanks to the amount of “free” information available on the internet these days, you’re more likely to uncover false or misleading information about weight loss. So it is best to be discerning about any weight loss program you may adapt. According to the Centers for Disease Control and Prevention, the safest and healthiest way to lose weight is to do so at a rate of about 1 to 2 pounds a week. Weight loss has to be gradual because it means having to make small lifestyle changes here and there that may be difficult to achieve if done all at once. For example, it might be a tad unrealistic to decide to turn vegan suddenly, in the interest of losing weight, if you’ve been a fast food binger all these years. So ease into it because, even if you only lose about 5-10% of your body weight, any small amount of weight loss still brings about great benefits. High Blood Pressure. Having a weight problem also makes it more difficult for the heart to pump blood to the different parts of the body, thus it has to work harder to do so. The result is an increase in blood pressure. Heart Disease. The blood vessels of individuals with serious weight issues are hard and narrow, thereby causing heart disease. Stroke. A stroke happens when the flow of blood to the brain stops. Fatty Liver Disease and Gallbladder Disease. These two often coexist in those who are overweight. A chronic condition that causes joint pain and stiffness. For overweight individuals, a lot of pressure is placed on the joints due to their excess weight. Sleep Apnea. It is a serious sleeping condition in which the person stops breathing for 10 or more seconds anywhere between 5 to 100 times every hour. This is because the airways are smaller in people who are overweight or obese. 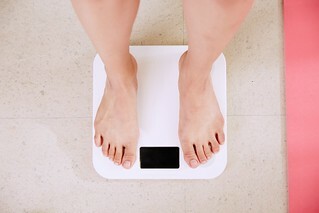 Now that we are familiar with the risks, let’s find out what causes weight gain. Generally, gaining weight is a result of eating too much and moving too little or consuming more calories than our body burns. Simple enough, right? Maybe. Some people blame their genes for their weight problem, but other than having a rare genetic disorder like Prader-Willi syndrome, which causes obesity, most people can in fact get down to a healthier weight. Other medical disorders may also cause weight gain such as hypothyroidism, but this disorder can be managed as well. When trying to lose weight, most people head directly to the gym, kill themselves on the treadmill, and eat enough for two persons right after. This is an exaggeration, of course. But some people are still under the misconception that when you exercise you can eat whatever you want, however much you want. Wrong! In fact, the secret to achieving a healthy weight is eating the right amount of food for your gender, age, body type, and height. This is exactly what the expression, “You are what you eat,” embodies. Generally speaking, weight loss is 75% due to one’s diet and 25% due to exercise. This conclusion was based on more than 700 weight loss studies. Now that we’ve established that, let’s decide on the best ways to cut down your weight. Cut the sugars. The easiest way to lose weight is to cut down on sugar. For the most part, the body doesn’t need much sugar. In fact, research suggests that sugar is linked to cancer as cancer cells need glucose to grow and multiply rapidly. Try replacing your daily 16 oz Coke with just water. You’ll lose 20 pounds of excess weight in a year, and your body will thank you in the process. The same goes for other sugary drinks like fruit juices. Your morning OJ packs in more sugar than a can of soda. Surprised? Don’t be. Read the labels! You can lose the extra weight by taking juices out of your diet as well. Lessen the carbohydrates. Carbohydrates turn to sugar. According to studies, if you need to lose weight, cutting down your carb intake to 30% of your daily caloric intake will give you faster results. Low-carb diets reduce your appetite by keeping you full longer, leading to weight loss sooner. Increase your vegetable portions instead and get more fiber into your system. Finally, other things you may know about how to lose weight include eating out less, lessening the portions you eat per meal, and avoiding comfort snacking. All these are lifestyle changes that you need to make to get the weight loss results you want. Living healthy and losing weight require a complete lifestyle change. This change is made up of the little daily choices we make. Fortunately, for those who live in and around Bellevue, WA, our nearby clinic can help you make those choices! At the Kirkland Health Institute, we can help you get the weight loss results you’ve always wanted by thoroughly educating you on the best ways to achieve and maintain your ideal weight. So come in for a consultation today and realize your weight loss goals for good!